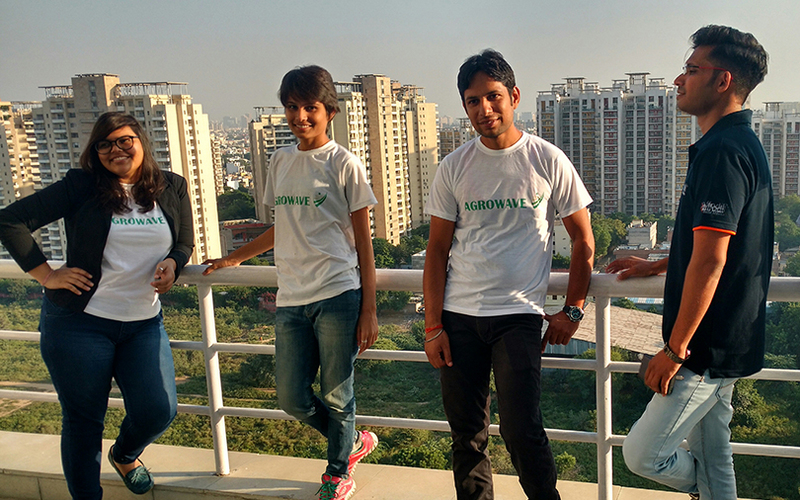 Anu Meena, founder and CEO of Agrowave (second from left) with the team. Dagrowave Agscience Pvt. Ltd, which operates fresh produce supplier Agrowave, has raised an undisclosed amount of angel funding from mobile app and cloud solutions firm Daffodil Software, which is owned by serial entrepreneur Yogesh Agarwal, a company executive told VCCircle. The Gurgaon-based company will use the capital to strengthen its tech capabilities and scale up operations, Anu Meena, founder and chief executive of Agrowave, said. Launched six months back by Meena, an IIT Delhi graduate, Agrowave procures fruits and vegetables directly from farmers in Haryana and Uttar Pradesh, and supplies to clients in Delhi-NCR. Retail stores, kirana shops, hotels, and corporate canteens comprise its customers. “We are trying to optimise the existing agricultural supply chain using analytics, research and technology. Our aim is to provide the best price to farmers by eliminating middlemen,” Meena said. The company uses technology to conduct quality mapping and demand prediction, and analytics to organise procurement, which helps avoid wastage. According to Meena, Agrowave does transactions worth Rs 50,000 daily with over 30 clients currently. Daffodil Software offers web, mobile and artificial intelligence solutions to clients across a number of sectors, including healthcare, fashion e-commerce, transport services, social networking and software services firms. Its clients include Nokia, Sony, Reliance, Infosys, Dell, and Apollo Munich*. A commerce graduate, Agarwal founded Daffodil Software in 1999 and Autoload India in 2015. His latest venture is an online platform that connects truck drivers and owners through a mobile app. Agro and farm firms that use tech solutions, supply chain systems, and retail businesses have generated considerable investment interest of late. Last week, Farm Taaza, a fresh produce supply chain management firm, raised $8 million in Series A funding led by Hong Kong-based Epsilon Venture Partners and Tara India Fund IV. In April, Chennai-based omni-channel fresh produce distribution platform Waycool.in raised $2.7 million from impact investor Aspada Investment Company. In February, Delhi-based Paalak.in raised funding from a clutch of angel investors. In the same month, International Finance Corporation, the private-sector investment arm of the World Bank, said it will make a debt investment of $30 million in ETC Agro Processing (India) Pvt Ltd. In another major deal in the sector, Jain Irrigation Systems Ltd, the country’s largest micro-irrigation firm, acquired Australian agri-tech firm Observant Pty Ltd this February, marking its fourth reported acquisition in the overseas market. In September 2016, Ooty-based Lawrencedale Agro Processing India Pvt. Ltd, which supplies farm-fresh vegetables to organised retailers in South India under the brand Leaf, raised an undisclosed amount from Denmark-based BESTSELLER FOUNDATION and US-based venture capital fund Unitus Impact. In July 2016, Delhi-based RP2 Ventures Pvt. Ltd, which runs fresh fruit and vegetable supply chain venture Lemon Leaf, raised its first external funding from two angel investors. *Earlier, the article stated that online healthcare startup Lybrate was one of Agrowave's clients. The article has been corrected accordingly.